I know that gin is the tipple at the moment. Wherever you go, the selection of gin that is available is really quite astonishing. Oh, dear, can’t stand the stuff myself. Anyway, it now seems that Fotheringhay, Richard’s birthplace, is to launch a special gin in his honour in Fotheringhay Village Hall on 30th November, from 11am–4pm, where orders will be taken. Well, I cannot argue with the statement that quinces were served at Richard’s wedding, I wasn’t there! Nor can I quibble that the fruit was a favourite of his. But if it was, it’s the first I’ve known of it. But it doesn’t matter, because I’m sure the new gin will go down a treat with gin-lovers everywhere. I trust they all drink a Christmas toast to our king! But for Channel Four, the implication of these banquets was that Richard ate his way through everything on the immense menu. Historically, he was actually recorded as eating ‘sparingly’. I’d like to see our present queen sitting at a banquet and proceeding to chomp the lot! Richard, apparently also drank far too much. Surely, if he was half-cut all the time, when everyone else wasn’t, someone, somewhere might have made a teensy note? I’m certain our ‘Enery Tudor (for one) wouldn’t have missed such a handy stick with which to beat his predecessor. The programme kept insisting that Richard’s diet was far, far richer than those of his peers and contemporaries. How do they know? How many other kings’ bones have they ground up to find out? I’m prepared to believe that Richard’s food was much richer once he became king, but the drinking bit is iffy to say the least. They all drank then – the water was as iffy as the conjecture about his booze-addled existence. And he didn’t sit at those banquets alone, so presumably everyone around him was chomping and slurping as well? So, no, I think Channel Four are hoping for a little controversy. After all, the programme shows that Richard could certainly do everything he is recorded as having done. That might equal ‘boring’ in TV-speak, so let’s home in on something else to crank up the hype. Ah yes – he was a lush! And he had worms. Mustn’t forget the worms. Always good for the shudder factor. Oh, PS, he had more worms than anyone else as well. Yes, neat suggestion. He was excessive in everything! Otherwise, I enjoyed it all. And nothing has shaken my loyalty or admiration for King Richard III. Adversity struck him on all sides in his health and private life, and in the public form of treachery by those who wanted his power for themselves, but still he was a remarkable king, whose Parliament did so very much for his people. Slightly built, drunk, suffering from indigestion due to gorging on over-rich food at breakfast in his tent, he still came within a few feet of giving Henry the Jelly a fatal dent to the helm. Bonk! One huge Ricardian clout would have been all that was needed, and bingo – no Tudor dynasty! No wonder Henry made sure to never again be on a battlefield. He must have bricked it big time when he watched the demon Richard hacking his way toward him. So well done, Dominic. 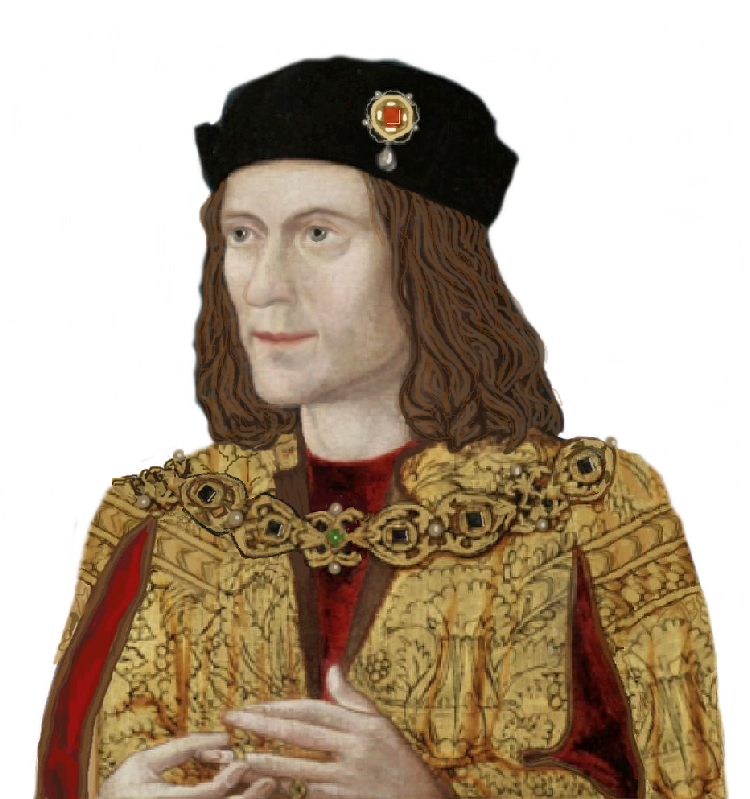 I think we now have a much more accurate idea of what Richard actually looked like, gracile arms and all. And Dominic now feels much more confident in himself, so while he did a favour for Richard, Richard has returned that favour. Good luck, Dominic, may your fortunes improve now on. We all wish you well.